I know it’s very Julia Child to say I just had these relatively non-standard ingredients lying around but, well, I did. I came back from tour and all I wanted to do was bake. So I filled my cart with things like mascarpone cheese and pounds of butter. And right by the checkout aisle I saw a special: FIGS. I love figs. I never get figs. I was going to damn well get these figs. The funny thing was, the woman behind me in line saw them at the exact same time (we even both uttered “Figs!” under our breath, just audibly enough for the other to hear) and reached for the same carton. A silent standoff ensued, one that in the midwest would have been accompanied by “Oh no, you go ahead,” and “Oh thank you, no please, these will do just fine,” but here on the east coast we only smirked uncomfortably as we pretended the other was not there. The woman took every single carton except the one I managed to grab. For a spontaneous last-minute checkout purchase, she must have known exactly what she was going to do with those figs. Either that, or (more likely) she’s literally just that competitive. It’s every fig-lover for herself, out here. Anyway, didn’t I say I was going to keep this short? 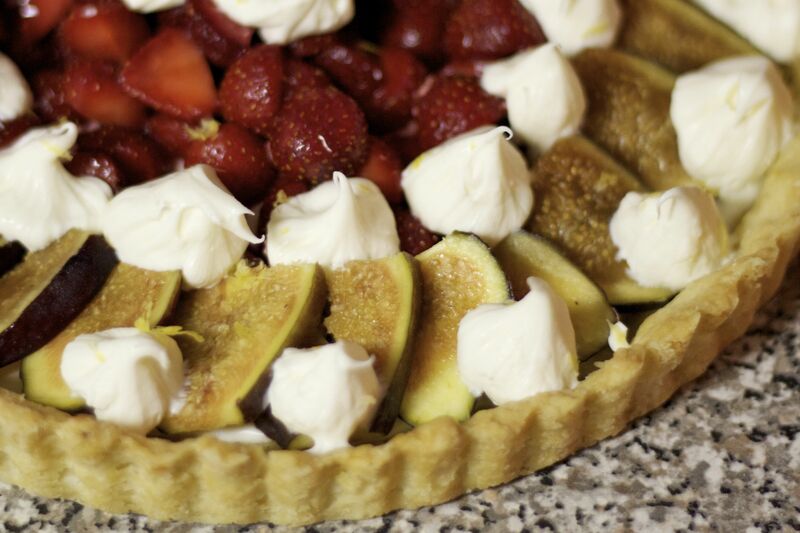 I planned to use up the last of my farmer’s market strawberries (the rest went into homemade strawberry lemonade and various and sundry cocktails) but there weren’t quite enough for the whole tart so I decided to use the figs too. I think the whole effect is rather lovely, don’t you? 1. For the crust: Combine the flour, sugar, zest, and salt in your bowl, then add the butter. With your hands, work the butter into the dry ingredients, sliding and flattening the fat between your fingers until it is evenly distributed and the mixture resembles coarse meal. Mix the water and vanilla together and sprinkle it over the dough, then lightly mix it with your fingers and press it all together until you can form a ball. Gather it all together, wrap it in plastic wrap, flatten it into a thick disc and refrigerate for 30 minutes. 2. Because the dough is soft and buttery, rolling it out is not necessary. Instead, you will press it with your fingers into the tart pan. (This part is fun!) Try to shape the sides first, if you can. Make sure the dough is evenly spread across the bottom and thinnest where the bottom meets the sides (since the sides will inevitably sink a bit during baking). Cover the shell with plastic wrap and freeze for 30 minutes. 3. Preheat your oven to 400°F. Take the crust straight from the freezer and slide it into the oven. (This eliminates the need for pie weights.) Bake for about 12 to 15 minutes, until the crust is lightly browned all over. Check it after five minutes or so; if the bottom puffs up at all, prick it lightly with a paring knife. 4. Cool the crust on a rack for five minutes, then beat the egg with 1 tablespoon of water and brush it lightly over the crust. Now, let it cool completely. 5. For the filling: While the crust is baking, place the strawberries in the colander over a mixing bowl and toss them with a tablespoon of sugar (you may elect to use more or less sugar, depending on how sweet your berries are). Let them macerate for 15 minutes or so and reserve the juices for cocktails, lemonade, or whatever you like . 6. Slice the figs stem to end in ¼” slices. Combine the honey and mascarpone cheese in a small bowl and spread about half over the cooled crust. 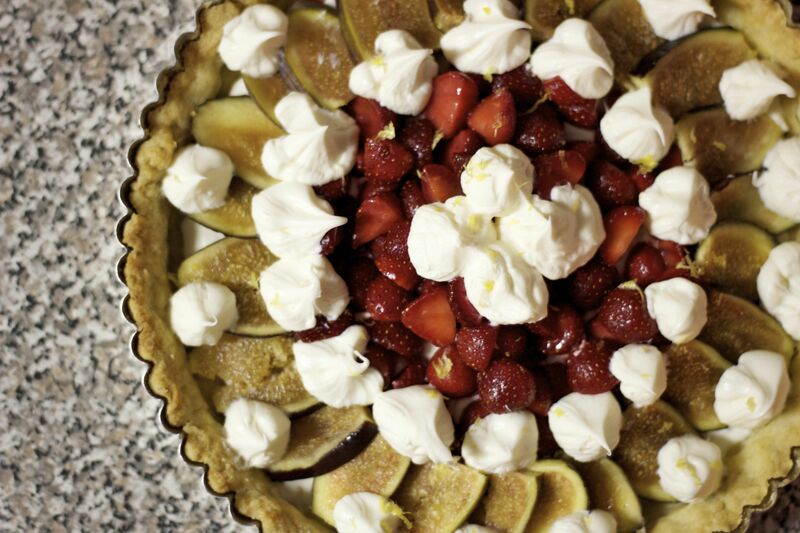 Pile the drained strawberries in the center and arrange the figs in a slightly overlapping pattern around the edge. 7. 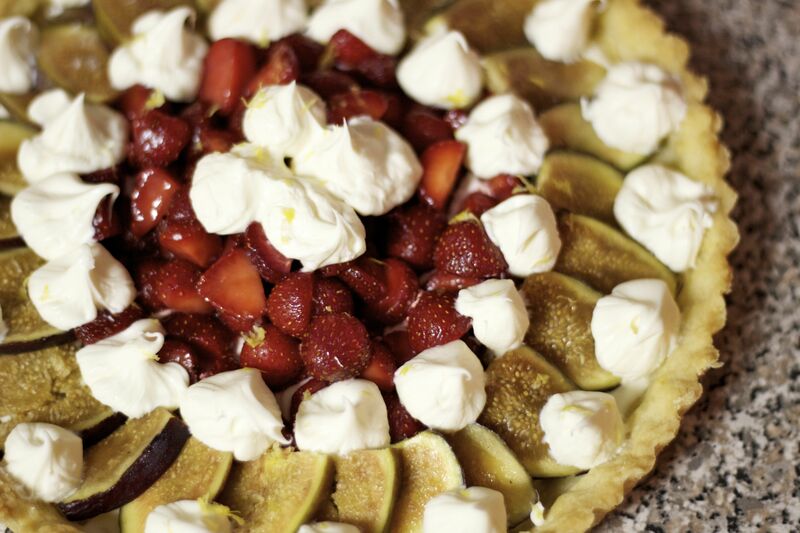 Place the remaining cheese in the ziploc bag and pipe decorative dollops around the tart. Garnish with a bit of lemon zest and serve. 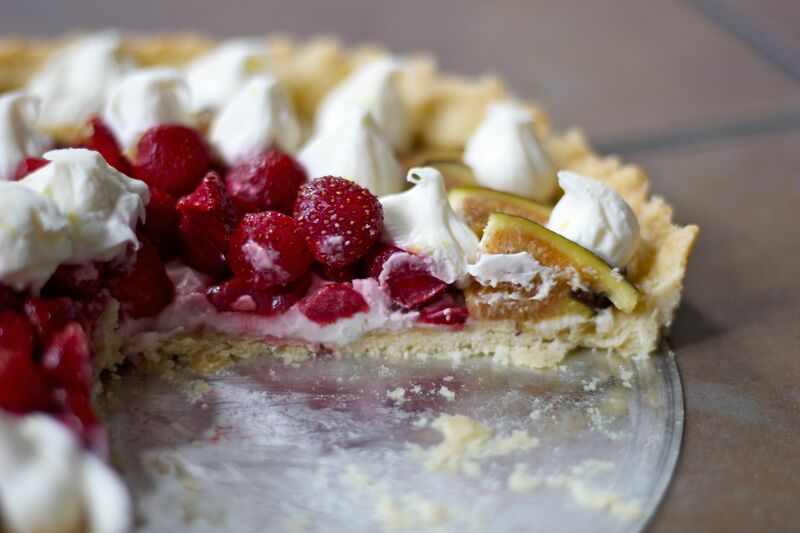 This tart will keep for three days, covered, in your refrigerator and makes an excellent breakfast. Just saying. Leftover desert for breakfast is THE WAY TO LIVE. You’re making me hanker for fresh figs. Looks awesome. It looks absolutely delicious and makes me want to have it. Now.